alaTest ha recogido y analizado 55 comentarios relacionados al producto Binatone Idect Boomerang PLUS TWIN. En promedio, la calificación para este producto es 4.3/5, al ser comparado con la calificación 4.0/5 de otros productos en la categoria Telefonía Inalámbrica. Analizamos las valoraciones de los usuarios y los expertos, la edad del producto y demás factores. Comparado con otros Telefonía Inalámbrica el Binatone Idect Boomerang PLUS TWIN recibe una alaScore™ global de 89/100 = calidad muy buena. Very good product but I found not enough ring tunes that are any good and maybe the mains leads could have been on the other side. The caller ID can not be when the hand set is in its cradle. i read the reviews on this item before I bought it and some weren't good but I have had no issues at all with it . the volume is great and the line is clear and I don't find it hard to put back on the base either. its very easy to use and looks fab ! 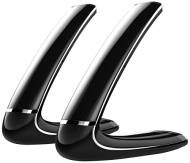 really stylish, wifi to connect 2nd handset so no wires.. sound and features excellent. love them.